2010 has come. 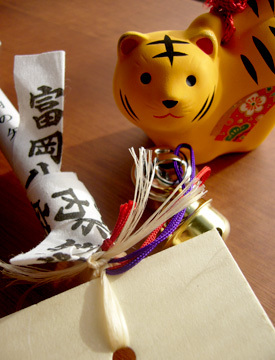 In Japan, we generally exchange a New year’s card with friends, colleagues and relatives instead of a Christmas card. Here is my card. 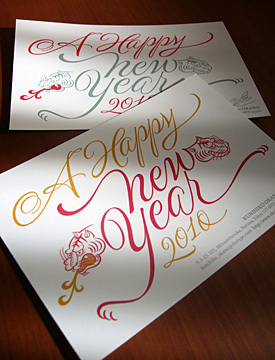 When we design a new year card, we use an image of animal to express new year, which is called Eto 干支. From mouse to wild boar, twelve kinds of animals are the members of Eto, which is also known for the Japanese ancient counting way not only years but also the day and time by using these twelve animals, which revolve every year one by one like Duodecimal. Tiger “寅:tora” is the symbol for 2010. Left: My new year card in 2010. Right: I bought a white arrow when I went to first visit to Tomioka Hachiman Shrine. And a lovely tiger ceramic bell my brother gave me. The later part of last year, I couldn’t provide any articles to update my blog. I don’t want to excuse it was because of the hard schedule. But as I concentrated on the type design project I joined, so some type design works were available by the end of last year. Thanks to the people who interested in this blog, I could get some comments and email last year, which encouraged me a lot, and I found those who are interested in Japanese font and type design all over the worltd. I was glad to hear from all of them. I’m sure I’ll post topics related to Japanese type design and typography in 2010. I wish we meet again and hope to get your interests to this site. Thanks.